Recently, TapSnap was featured in the Calaveras Enterprise, a news publication from Calaveras County, California. Centering on TapSnap franchisees Andy and Jill Fuoco from Murphys, California, the article discusses how the Fuocos noticed both the fun generated by photo booths at parties and the growth of social media and capitalized on TapSnap’s ability to combine the two. The article elaborates on TapSnap's features and the user experience. The Fuocos' past experience as owners of DVDNow is also profiled, following with how they got involved with TapSnap on the ground floor. As the mother of a recent elementary school graduate who used TapSnap at their graduation party stated, "kids love" and its "new technology." TapSnap was a big boost at the Mark Twain Elementary 2014 graduation, where groups of students took photos and uploaded them to social media for their parents to view from the comfort of their homes. The article closes with an explanation of SnapCast, and the Fuocos' future plans for expanding their TapSnap franchise. Source: Piel, Jessica. 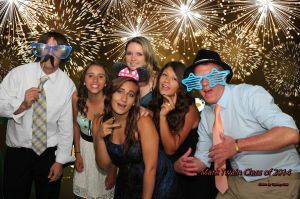 "Murphys-based business brings new technology to photo booths." Calaveras Enterprise, July 11.